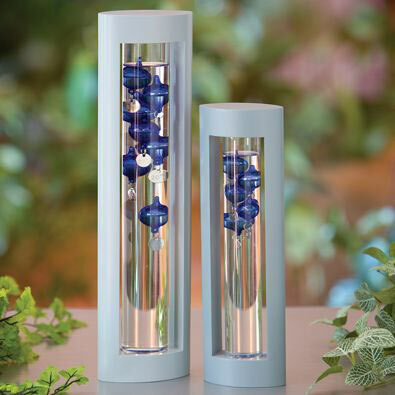 Our galileo thermometers combine unique modern design with old-world science. The contemporary steel grey wooden frames hold a liquid filled tube with dark blue floating spheres inside. Each sphere includes a hanging metal temperature indicator, one side fahrenheit, the other centigrade. The lowest floating sphere at the top indicates the curent room temperature. A functional work of art to adorn your home or office. Makes a truly memorable gift. Available in two sizes. Medium size measures 11" tall x 3-3/8" wide with five spheres. Large size measures 14-1/2" tall x 3-7/8" wide with six spheres.